Fits children 30 lbs to 120 lbs. Provides easy and secure LATCH attachment to vehicle even when not occupied. Energy absorbing AirTek foam provides superior cushioning and increased airflow for comfortable ride. Longer seat bottom - Proper leg support with cushioned comfort. Prevents submarining with angled and reinforced seat bottom. 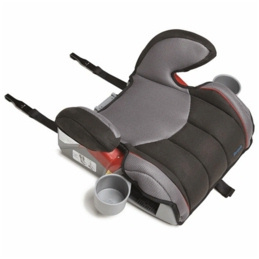 Tapered seat shape - Properly fits a growing child at every stage. Retractable cup holders - Extra deep to keep drinks upright. Bottom rubber pads - Better grip and helps protect vehicle upholstery. Product dimensions: 9.75" H x 19.5" W x 16" D.